Now she brings a lifetime of creative achievement to a musical talk that resonates with audiences hungry to know about the steps to creative expression. From symphony patrons to the creative corporate team – the seven strings of passion takes your audience inside the creative process, to a distillation of the step that can be used for teams or individuals – to create or reinvent anything. “I’ve spent the past 2 decades reinventing my instrument, creating One-Woman shows, online learning programs and even a fully-orchestrated PBS music special. What this journey taught me was how ideas resonate through people, how groups collaborate, how leadership – and followship – takes many different shapes. 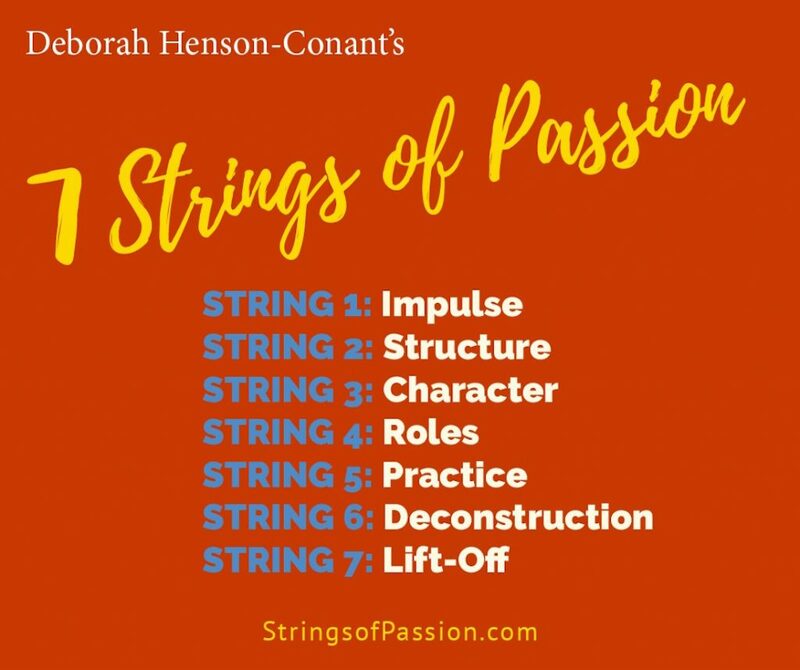 Using the 7 strings in each octave of her instrument, Henson-Conant introduces the seven principles that take us from creative IMPULSE to creative EXPRESSION: Impulse, Structure, Character, Roles, Practice, Deconstruction and Liftoff. She shows us that every creation begins with an impulse – and to harness that impulse, you need the support of a flexible internal structure. To bring that structure alive, you need character, and to put it into action, or collaborate with others, you need to understand how roles works – not just leadership and followship, but the unique roles in any collaboration, and the internal, archetypical roles we can use to support and illuminate the ways we show up. To think in new ways you need to have a practice of inquiry and exploration, embracing and nurturing the imperfection of nascent ideas, and use the roles of both active leadership and followship for a powerful performance. In order to be able to play with your ideas, you need to be able to deconstruct old assumptions and take the work down to its most distilled form. Once you have form and structure, the individual or team, has a resonance with what it’s doing. All this leads to the moment of lift-off, or inspired, informed performance – not the moment when everything achieves perfection, but the moment of letting go, when you glory in what it is, exactly the way it is right now. The more an individual or a team works with these seven concepts, the more resonance builds between the outer expression and the internal intention. Innovation, bold ideas and action teams result because they dare to explore and excite the world around them. “Strings of Passion” opens the mind-share and heart-share of the attendees and inspires them to dare that exploration. 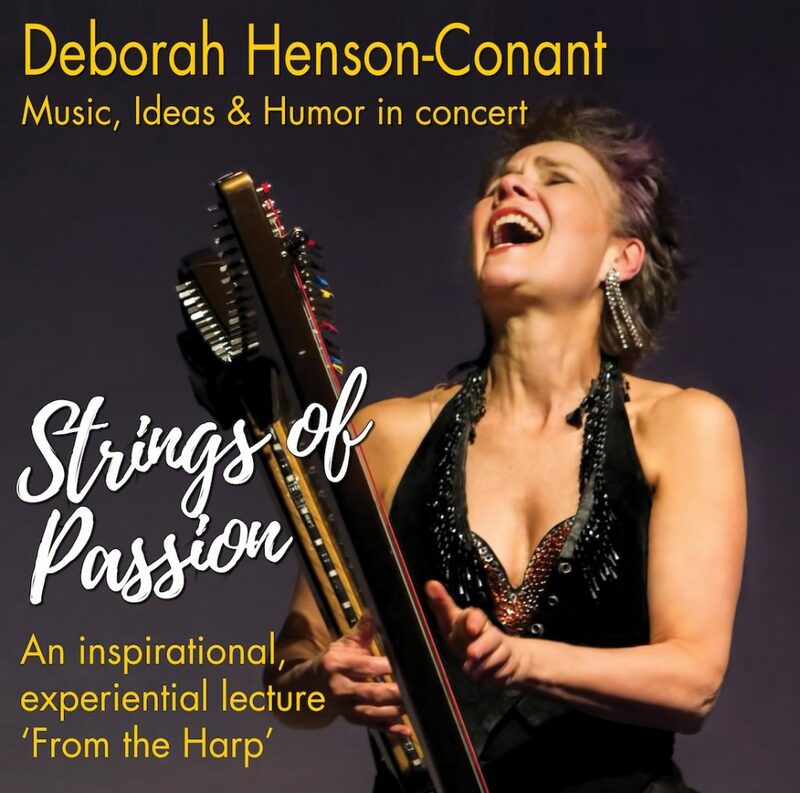 “Strings of Passion” is a powerful exploration of possibilities – moving your audience out of the ordinary and into the extraordinary. And in the end your team experiences the powerful resonance of collabrative expression – like a symphony orchestra. These short video (30 seconds to 20 minutes) are from an online version of this program specifically for harpists. These videos are exerpted from a warm-up webinar that led to a 10-week program about the Strings of Passion. Deborah Henson-Conant (“DHC”) is a Grammy Nominated recording artist, a favorite speaker of the “Ideas Boston” conference and the creator of her own PBS music special “Invention & Alchemy.” Her collaborative, cross-discipline performance project “Inviting Invention” was a feature of the 2nd annual Boston Science Festival. She’s known as a boldly creative performer and thinker. “Strings of Passion” pairs those two together in a performance lecture like none you’ve ever experienced. #1 Impulse: The impulse to do, to reach. The impulse of desire – understanding that before we get caught in the web of wanting to be desired, wondering if we’re good enough, wanting to be chosen, there is a fundamental spark of desire to engage and to create. This is the heart of creative impulse. #2 Structure: Not externally imposed structure like a tight pair of pants but a flexible internal structure, like a skeleton, that helps support and strengthen your expression as a human being. In a sense, structure is the thing we all share – it’s what makes things the SAME. #3 Character: is what makes things DIFFERENT and what those differences are. How we differentiate ourselves, how we express our particular character through the things we do. Or how a composer expresses the character of music – not so much through the underlying structure – because that’s often the same from piece to piece – but through the harmonies, the specific notes, the melodies, and HOW they’re performed and expressed. A. Leadership / Followship: The seemingly simple and opposite characteristic of inside/outside – the sense of how the ‘opposites’ inform each other. B. Our role in a situation: Where do the parts fit in the whole – especially when engaging wth other people, including imaginary people in our minds – because if you don’t understand that they are roles and what those roles are, then you can’t change them and you get stuck in a role thinking it’s ‘you.’(This can also happen with Character – that you think something is actually ‘you’ until you start to break it apart and get deeper into it. This is how we can start ideating: “I’m a failure” and how you can take certain characteristics and think they’re the only way you can be. In fact you can take away many of these ‘characteristics’ and sometimes get closer to the truth of who you are.) This is especially important in any kind of group improvisatory form or group sports because understanding what role you’re playing and what the STRUCTURE is that you’re playing is what allows you to play together freely. C. Archetypes or personas: They can be well-known ones like “The Goddess Athena” or a very personal archetype like “My dad” or “The Postmaster.” You can pull these archetypes in and learn about how to BE from being them. This can happen in a destructive way, like with bullying where someone gets bullied and may then become a bully. But you can make choices about this – especially when you want to be creatively expressive. So when you use a broom to play air-guitar, or when you play air-harp one thing you may be doing is bringing in a kind of archetype, even if it’s not a specific person or character. It’s still YOU but informed by this other persona or archetype. If you get STUCK in that archetype it can disconnect you, but if you’re doing it consciously, you can use it to inform and see how it expands you. A. Practicing to be able to do something specific or to be able to ‘GET’ something you don’t have yet. Usually something you can’t achieve or execute or express right now. B. Creating a practice or ‘having’ a practice that puts you in a position so that what you want can GET to you. It’s basically investing yourself in going to the shrine of your inner creative genius and hanging around waiting for it to show up and really BEING ready and willing. This is more like allowing. You can see that this is similar to ‘roles’ and ‘character’ in that you could look at these two as ‘inside’ and ‘outside’ forms of practice. But I think of it more as the DOING and BEING forms of practice. So there’s a lot of inside-and-outside in the Strings of Passion and how they affect and inform and enrich each other. And there are also deeper levels of inside and outside. #6 Deconstruction: This is where you remove the characteristics and details as much as you can and find out what this thing IS in its most fundamental form. You can think of it as a distillation, decomposition, deconstruction – but what deconstruction really does is lead to reinvention. The minutia or details can be very rich, beautiful and fascinating, but that’s often not what the thing “IS’ – but rather ‘how the thing is appearing now.’ They have huge value, but to be able to reinvent you need to get down to the structure. Once you’re down at that fundamental flexible structural level, it’s infinitely reinventable, and you can always go even deeper and find a deeper flexible structure that’s even more fundamentally true and universal. It’s when you’re out on the detail level that one thing seems fundamentally different from another. So you want to be able to travel along that line from detail to fundamental. #7 Lift-Off: When you let go of everything that you AREN’T in this moment – you forget about the strings, the practice, about everything – and you trust what has STUCK – what has become part of you and you simply express yourself and TRUST that whatever comes out, even if it’s not even CLOSE to what you think is SUPPOSED to be happening – that this is YOU. And it will become more and more authentic as you do this work. Noun-form: “A Practice” – What is a creative practice? We lift off when we let go of what is holding us down, and launch with full intent exactly as we are. How do we bring these concepts to our performance – in life, work and artistic expression? NOTES: DHC travels with her electric harp, looper pedal and back-up wireless unit.